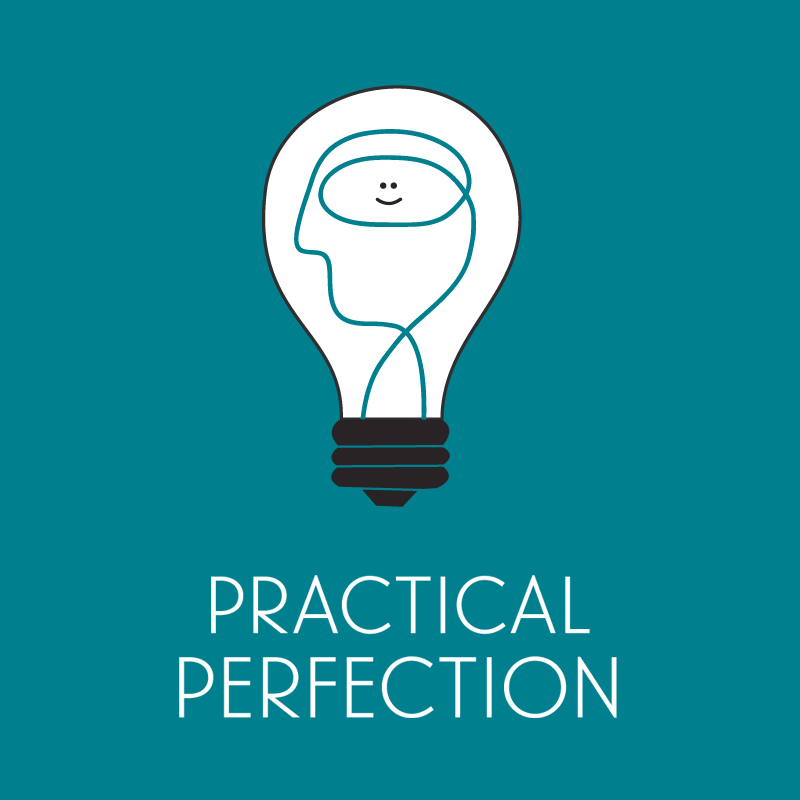 My next book, Practical Perfection is coming out in February 2016. But I’m just dying to share a little bit of it with you guys, especially as I know that even just this small bit of it will be incredibly useful to many of you. So … here’s the introduction to the book and a framework I’m really, really proud of. I hope you enjoy! Ever heard those words? I certainly have. And I’m sure you have too. (If you haven’t, then perhaps this isn’t the book for you.) They’re the bane of any committed striver’s life. Always well-meaning. Often true. Seldom helpful at the time. Because of course we’re hard on ourselves! It’s how we achieve big things: by setting high standards and then working our butts off to meet them. That sense of working so very hard but getting nowhere. Are you nodding? Me too. Because for a long time these were the stories of my life. Yes, I got to tick lots of boxes and strike lots of things off lists. But it all came at a cost: I wasn’t being the person I wanted to be. Constantly tired and irritable? Tick. Always vague and distracted? Tick. Completely unable to sit still and just relax already? Tick. Some people say having kids killed their ambition. Not me. Having kids added to them. Now, as well as wanting to hit all my personal goals and be an amazing wife, daughter, sister, boss and friend, I also wanted to be a kick arse mother. Except I now had a lot less time to achieve it all. So it will come as no surprise when I tell you that 18 months after my first child was born I had a complete breakdown. All that striving and holding myself to unrealistic standards didn’t so much tip me over the edge as hurl me into a deep, dark hole of stress, anxiety and depression. I used every strategy and tactic I knew to try and claw my way out of that hole. But in the end I succumbed, completely losing myself, my confidence, and any sense of who I was. So what got me out of the hole? Well, I became very self-aware (therapy will do that for you). And this allowed me to notice that I was consistently repeating certain patterns of behaviour. Once I started seeing these patterns in myself, I began seeing them in the highly-driven people I tended to surround myself with too. We were all constantly flirting with overwhelm and burnout; it felt like if we weren’t right on the edge then we weren’t pushing hard enough. If a tiny bit of space opened up in our lives, we had to fill that space immediately. And yet we were constantly rueing that we felt like hamsters on a wheel—running our little butts off but getting nowhere. What was driving our behaviour? More often than not, it was the pursuit of perfection. When we think of perfectionism, we tend to think of someone who literally needs to be perfect at everything they do (which means I’ve never thought of myself as a perfectionist because there’s plenty of stuff I can be half-arsed about!). In reality, however, perfectionism presents differently in different people. Self-oriented perfectionists adhere to strict standards while maintaining strong motivation to attain perfection and avoid failure. They also engage in stringent self-evaluation. Other-oriented perfectionists set unrealistic standards for significant others (e.g. partners, children, co-workers), coupled with a stringent evaluation of others’ performances. So it appears I’m a self-oriented perfectionist. And you know what? It’s not all bad news. This is important in the context of this book because it reflects where I have gotten to with my own brand of self-oriented perfectionism: a place where I feel like I’m in control of my life (as much as anyone can be in control of their lives) and thriving as a person instead of constantly teetering on the edge of overwhelm and burnout. How did I get here? Well, I developed a framework for myself. What’s easier is to be self-aware; to understand what’s stopping you from living your best life, and develop strategies to manage those things. Passions: things that got me out of bed in the morning with a smile on my face. Prioritisation: knowing what actually mattered most to me, and then making the conscious decision to focus hard on those and let go of the rest. When I look back over my life, I can see that whenever one of those three key things was lacking in my life, problems arose. 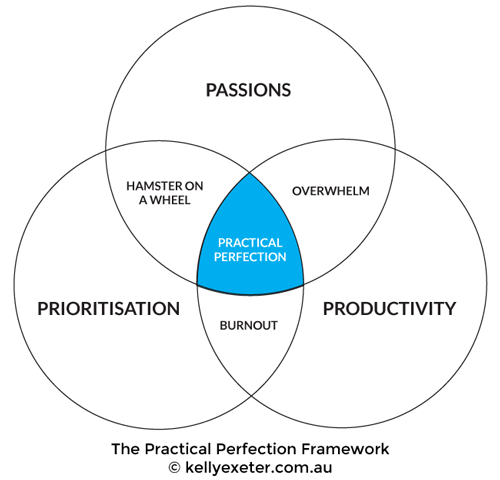 Productivity + Prioritisation = Yes, I got a lot of stuff done. But without any of my Passions, I burnt out because nothing made all the stress and anxiety involved with what I was doing ‘worth it’. Passions + Productivity = I was doing a lot of things I loved. But without Prioritisation I was stupidly busy and in a permanent state of overwhelm because every opportunity or request seemed like a good idea. Prioritisation + Passions = I thought it was important and appropriate to try out every cool new idea that entered my head, and chase after every bright, shiny object that crossed my path. But I never finished anything before moving on to the next. I was the proverbial hamster-on-a-wheel. When all three were present in my life, however, I was able to operate in a zone of what I call Practical Perfection—a place where I could achieve the things I wanted while having time to be a good person and enjoy a happy life. And that whole ‘zone’ thing is one of the things I love most about the Practical Perfection Framework. Those of us with perfectionist tendencies usually strive for a ‘sweet spot’ in life—a place where all the planets align and we feel like we’re ‘there’. Unfortunately, that state of perfect balance only lasts for a moment before things inevitably shift and the moment is gone. How utterly depressing and de-motivating! 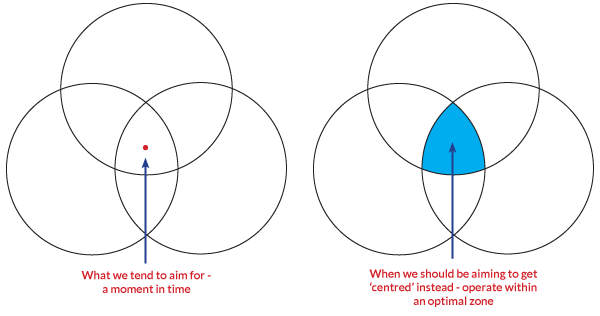 Striving to operate within a ‘zone’, however, is much more achievable. And when you do slip out of the middle zone of Practical Perfection and into one of the other areas (which will inevitably happen), the framework tells you what you need to get centred again. On the brink of burnout? Time to inject some more passions back into your life. Overwhelmed? Time for some ruthless prioritisation. Feeling like a hamster on a wheel? Time to put your head down and get productive. A life where you get to achieve the things you want to achieve, but without the constant stress and overwhelm that usually goes with being a person who sets high standards for themselves. A life where you have time and space to be good to the people closest to you. A life where you have time and space to be good to yourself.